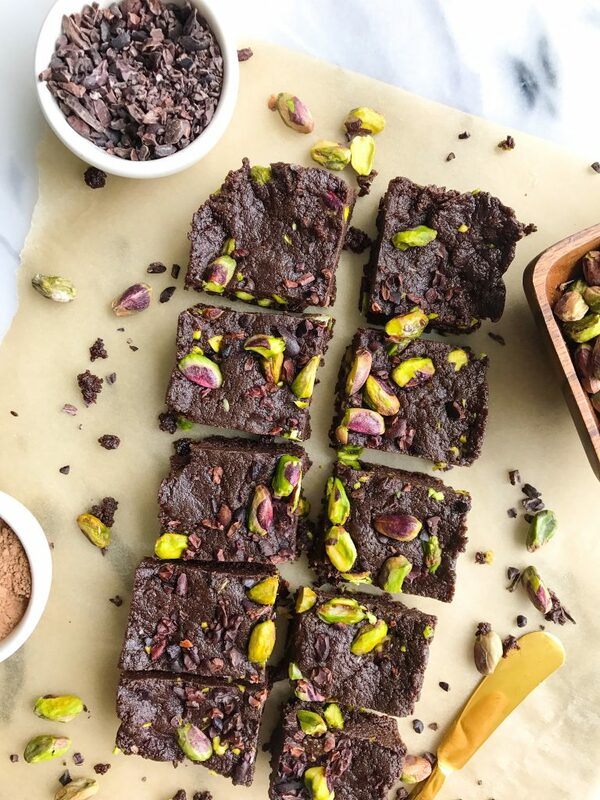 Dark Chocolate Pistachio Protein Fudge Bites for a delicious low sugar, vegan treat! I have been on a serious FUDGE binge lately. I have been craving that chocolatey, rich and delicious dessert non-stop and believe or not, I have never made fudge before. I always thought of fudge as something so indulgent and filled with heavy ingredients. Or something people buy at the Jersey Shore since I remember seeing fudge everywhere around there years ago. 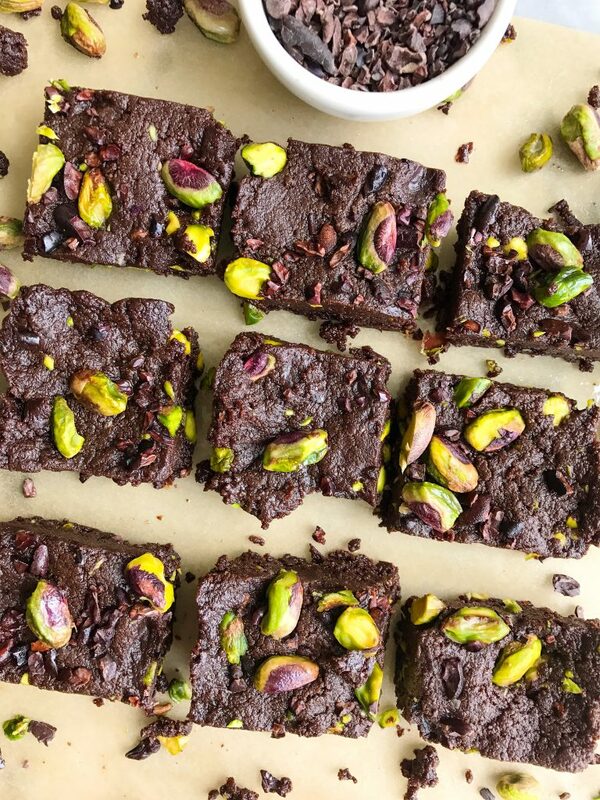 These Dark Chocolate Pistachio Protein Fudge Bites aren’t exactly the traditional fudge you may be used to. 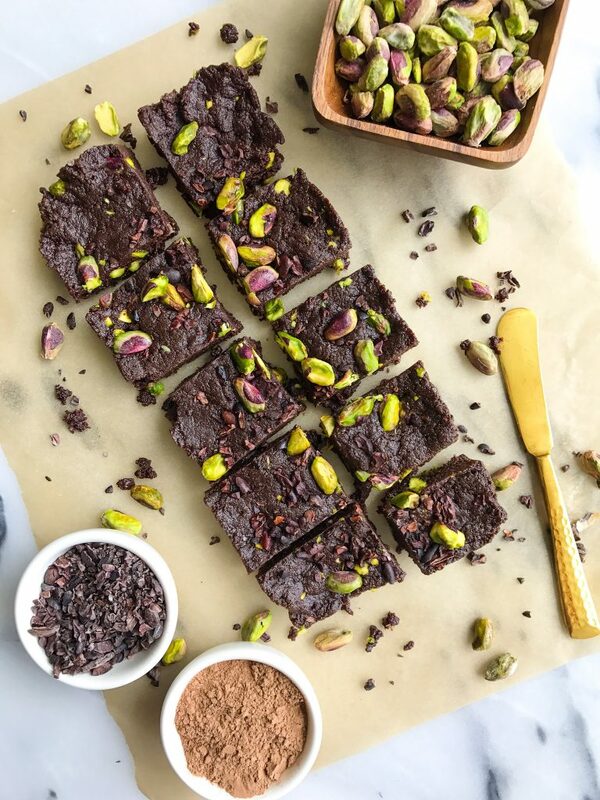 We are giving fudge a whole new meaning on the blog today and you won’t believe how simple and healthy these ingredients are. Plus this recipe is SO easy to make and takes minimal prep work and dirty dishes, and we all know I am the queen of making a mess then cleaning up the dirty dishes. These fudge bites are a mix between brownies and a rich piece of fudge.. without all of the added sugar. Full disclosure, my Dad ate one and was like “did you even sweeten these?” I giggled because I have really been adding less sugars to things (even natural) and my taste buds have seriously changed. But the best part about this recipe is you can really accommodate it to your taste buds so if you want some extra sweetness, add a little more maple syrup or your preferred sweetener. The real star of the fudge show here is REBBL. 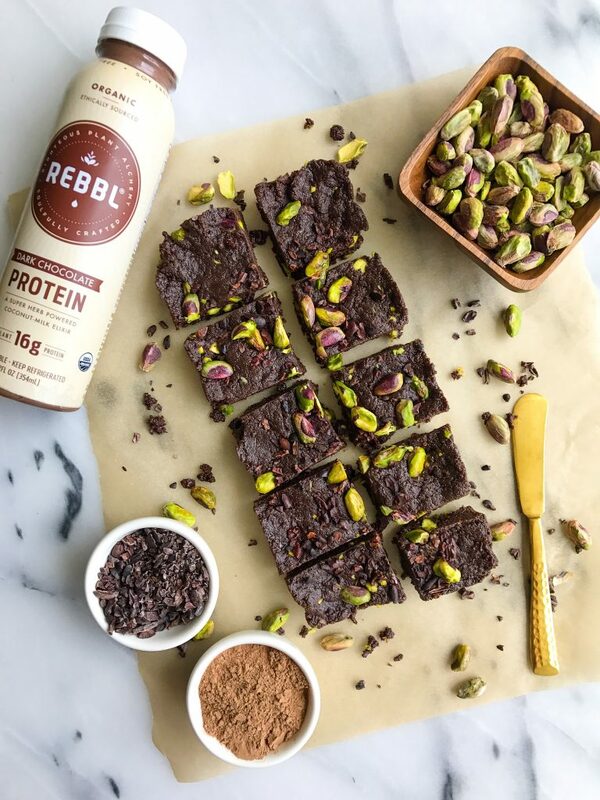 Instead of adding nut milk or butter for creaminess, I use REBBL Dark Chocolate Protein. And to be honest, they describe this bottle the best.. “Decadence that nourishes.” This is my current favorite REBBL flavor because of how chocolatey and delicious it is but at the same time is filled with 16 grams of plant-based protein in the bottle. It also has Maca, Ashwagandha and Reishi for the extra adaptogens/super-herbs. By now you are familiar with REBBL as they are one of my most cherished brand partners. I truly love their elixirs and protein beverages. I love and admire what the brand stands for and they are the OG super-herb company. They knew what maca was way before it was a buzz word in the industry. All of their ingredients are organic and are good for the mind, body and soul. You can’t go wrong with any flavor (hello Matcha Latte and Turmeric Golden-Milk), and I love that you can drink it right out of the bottle or get fancy with some recipes like this fudge and a few others here on the blog. *Store in freezer for best quality for up to 1 month! What can I sub for the rebel? I do not have access to that product in my area. any nut milk is great! These are one of my favourites of yours!! Thank you for such an easy, delish treat. Do you think 1 tbs almond flour would work in place of the coconut flour?